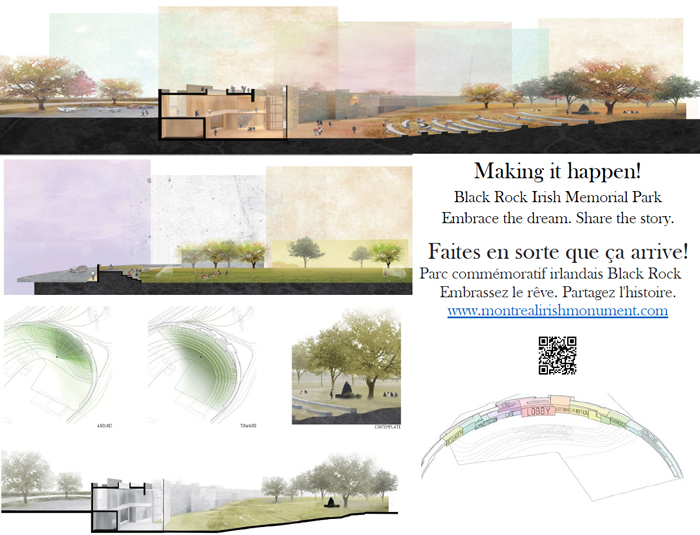 Welcome | Montreal Irish Memorial Park Foundation, Inc.
...and to acquaint yourself with our plans! 2018 was a very positive period for the project to build a Memorial Park around the Black Rock. Hydro Quebec & the City of Montreal (along with the “Irish Committee”) have contributed a tremendous amount of time and effort with many, many meetings in the past months to making this effort a reality. Although we try to keep everyone informed mainly though our FB page as the effort progresses, we now believe that we have enough new information on some possible ideas and concepts, to be able to provide a more formal update to anyone that might be interested. Of course, there is still much to do in areas like technical considerations, financing etc., before any plans are finalized, but we do think that once everyone sees the stage reached today, most people will be suitably impressed. So a formal update is now scheduled for this coming Thursday…..
Thursday, January 17th 2019 at 7pm. St. Gabriel’s Church Hall (2157 Centre St.) in Montreal (Point St. Charles). Please do take a moment to confirm your attendance on this FB event page…. As we go into 2019, there were a number of positive developments on the project in the last months. (As mentioned, most of these updates are noted quickly to our Facebook page). Briefly, over the last months, we have had a number of meetings with representatives of Hydro Quebec and the City of Montreal. And, as we closed 2018, we are at a stage where there are 4 separate proposals on how the Memorial space might be developed. At this point - theses designs are basically concepts; and more details on infrastructure and financing are still to be discussed. The Montreal Irish Monument Park Foundation along with a few other representatives of the Montreal Irish Community has been meeting with Hydro Quebec and the City of Montreal over the last few months. As mentioned, Hydro purchased the land around June 2017 to build a substation on the property. Pour negotiations involve try9ing to have the substation use as small a footprint as possible on this important burial ground allow the City of Montreal to build a proper memorial space to the 6000+ Iri8sh that died and were buried there in 1847, as well as the many Montrealers that went to provide help and care to these poor and dying Irish immigrants. The meetings have been going well and in a very co-operative manner between all the parties involved. We will certainly inform you of any more details as they become available. On Tuesday, October 10, 2017, Hydro started digging a series of holes at the site, each perhaps about 2” around; and maybe 8-10’ deep. This action is, of course, a requirement by law to check for soil contamination before new construction. Earth is removed and then sent to a lab for testing. So Victor Boyle, in his capacity as Canadian President of the AOH, (Victor is also a Director of the project) organized to have Father McCory present as this work started. (As many of you know, Father McCory is a Montreal Irish Catholic Priest assigned to St. Gabriel’s Parish in the Point). 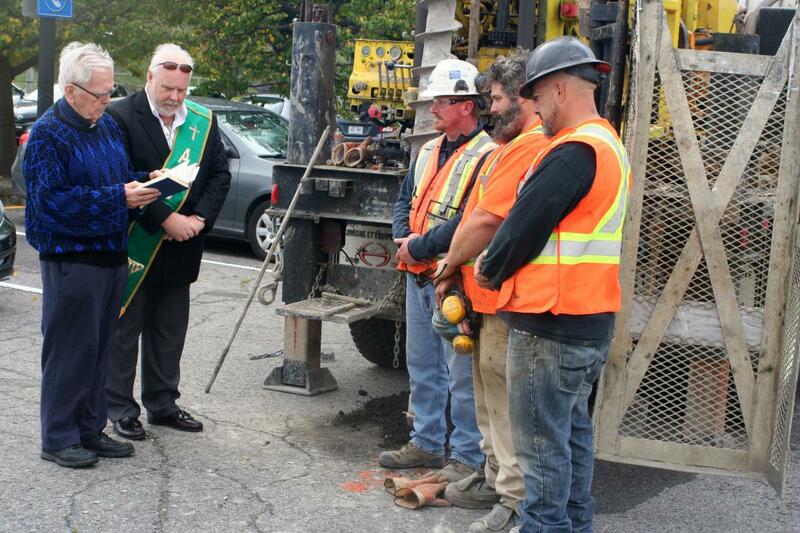 As the majority of the 6000 victims buried in the area in 1847 were both Irish and Catholic, the Good Father took a moment to bless the space, as well as the workers on the site; and their task. We certainly have to take a moment to mention that the company doing these tests seems to be called GHD – likely a contractor for Hydro - and the guys working were absolutely terrific. Couldn’t have possibly asked for more co-operation. They shut down their machinery so Father could give his blessing and mentioned that in all the years that they have done this work, they had never been blessed before and seemed pleased with the small ceremony. So thanks to Father McCory, Victor Boyle and the workers on the site – it just seemed like the right thing to do as they drill into the ground. We don’t really suspect that any sign of the victims will be uncovered, but with 6000 buried there; and the haphazard fashion that the burials were conducted – particularly in the late fall of 1847 - one never knows. We will likely drive you crazy with reminders of this event. Simply because this is an important year for having various levels of government take some serious step in building a beautiful green space around the Black Rock. The effort has been going on for at least 5 years (much long if you consider that Irish Montreal asked for a similar memorial space as far back as 1907). This is a crucial years since we hear rumours that the space will be developed with at the most very minimum consideration to remembering the terrible events of 1847 that affected not only Irish Montrealers but indeed all Montrealers; Quebec Citizens; and Canadians. As strong attendance at the Walk to the Stone might remind our bureaucrats and elected officials that we demand that this extremely sacred; historical, and cultural space be reserved for a green space memorial. On average, there is usually about 200 people that attend this Walk, but this year, we are hoping that with your help; and with your friends and family in attendance that we will be able to greatly increase participation this year. And, of course, one does not have to have any Irish descent at all to appreciate the significance of this space. This is our new project “tag line” – please use it whenever you discuss the effort; or wherever you feel it is appropriate…. At a recent meeting with some members of the Montreal Irish Community about the project, there was a suggestion that we make a poster for the project. So designed by Victor Boyle; and including some of the project development ideas from the architectural students at McGill University, we have now printed some posters. Since they are high quality (the image might not do it justice); and therefore high cost, with our very limited budget, to-date, we have only been able to print 10 of these posters. We are hoping to display them at various locations and events which they might get high exposure. So if any of you have a suggestion on where these posters should be displayed, please do not hesitate to contact us directly. Download a printable version of the poster in PDF format. As some of you may remember, at the same time that Michael Collins was running his great marathon from Grosse Ile to Toronto; we mentioned that a gentleman by the name of Kevin Moynihan, a former Montrealer and a Canadian Documentary film producer was working on a new Doc about Black ’47. He has now completed his excellent work, and although there might be an official opening for his documentary in the future, he has given The Montreal Irish Monument Park Foundation permission to provide you all with a link on YouTube where he has posted it. His documentary is called THE FAMINE IRISH and runs about 47 minutes. Kevin mentioned that he would really like your comments / feedback about his production which can be posted here; or, on in the comments section of YouTube. He includes highlights about our project; our Grey Nun’s exhibition and other details – many are extremely interesting and I learned a few things from his production. We have now set up a separate page on our main web site where anyone interested can make a $ 10.00 (or more) donation to help market our green space around the Black Rock effort - and - we will send our very new lapel pin as a “Thank You” for your donation. 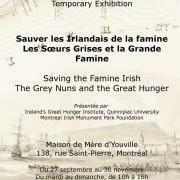 We are very pleased to note that the Grey Nuns exhibition called “Saving the Famine Irish: The Grey Nuns and the Great Hunger” is now open for viewing at the Grey Nun’s Motherhouse at 138 rue Saint Pierre in Old Montreal. Currently the exhibition can be visited any day between about 10am and 4pm – but an effort is being made to extend, or offer a few evening hours. The “Saving the Famine Irish: The Grey Nuns and the Great Hunger” will be on display until the end of November – and is running at the same time as one that is on display in Dublin, Ireland – “Grey Nuns Famine Exhibit at Glasnevin Museum in Dublin”. It involves very similar items as will be found at the Dublin one, with the exception that here in Montreal, the display is bilingual; and also includes some terrific paintings about the event by a local artist, Karen Bridgenaw - which were not available when we had it at the Centaur. MICHAEL COLLINS IS OFF & RUNNING !! As mentioned Michael Collins is running from Grosse Ile to Toronto to raise awareness of the tragic events of the Irish immigrants in 1847, as well as, to raise some funds for various Irish Monument efforts including our Montreal Irish Monument Park Foundation efforts to build a beautiful cultural green space around the Black Rock. He is scheduled to arrive at the Black Rock, this coming Friday, June 17th 2016 at noon – and everyone else, is welcomed to meet him there and welcome him to Montreal. We had the opportunity to meet Michael in Quebec City this past Thursday, June 9th, and then to accompany him to Grosse Ile, yesterday, Friday, June 10th to see him off on the start of his run. James Donovan & Joseph Lonergan were representing the Irish Community of Quebec City; and gave Michael a great tour of Quebec City on Thursday highlighting especially all the Irish points of interest relating to the city. Then on Friday, we went to Grosse Ile where Parks Canada did such a terrific job of showing Michael around the Quarantine Station where more than 5000 Irish immigrants died and were buried mostly in the summer of 1847. And then after this visit to Grosse Ile, Michael set off from Berthier sur Mer, where the ferry from Grosse Ile docks, on his long running journey to Toronto. There is a group of “lady painters” in The Point that call themselves The Group of Sven. Most Sundays during the year they get together to paint and chat. And, then once a year, they hold a Vernissage to display and sell their paintings for the benefit of the Point St. Charles Community Theatre, and our free Youth Theatre program. This year, their Vernissage takes place on Saturday, June 18th from 4pm until 6pm. So we asked the Group of Sven if they would consider painting some of their concepts of the Black Rock. Many of them did, and these painting of the Black Rock will be displayed and on sale at the Vernissage on Saturday. However, Karen Birdgenaw (one of the group; and a terrific painter) went one step further. We told her about some of the stories from Montreal’s Black 47, and she, in turn, took 3 of these stories and produced 3 paintings. One is about the Grey Nun carrying a sick and dying Irish child; the second is about the fact that there are bodies buried under the Black Rock; and the third is about the Catholic priests who performed the very dangerous task of leaning close to the mouths of these victims to hear their confessions. All three of her paintings are very, very powerful. And, we plan to add these paintings to our Grey Nuns exhibition – since they really convey the ideas, but we doubt that anyone would want to buy them; and hang them on their living room wall. So if you are available this Saturday, June 18th between 4 and 6pm, do drop by the Vernissage at the Old Bank, at 1900 Wellington St. in The Point and see their great work (of course, not all the images are of the Black Rock, or related to our project). The Walk to the Rock on Sunday, May 29th was a great success. You can see some videos of this event by visiting www.thepoint.ca and if not on the opening page when you visit, just click on the page’s YouTube site at the top of the opening page. A quick update on our progress to build a beautiful green space around the Black Rock. As reported before, we did meet with Mayor Coderre almost exactly a year ago, in May 2015, at which point he informed us that he does support the effort. Then we discovered in December 2015 that the actual land is owned by the Federal Government. So we are pleased that we will have another opportunity to meet with our Mayor tomorrow, May 27th 2016, to discuss the effort in general. We have also arranged for an appointment in very early June with Old Port of Montreal, who, along with a federal agency called Canada Lands Company, actually own the property. So this note is just to let you all know that there is progress on the effort and we will report back about our meeting with the Mayor on Sunday, May 29th at the Walk to the Stone; and will post any other information on this site shortly. Thank you all for your support – and hope to see you all at the Walk to the Stone on Sunday. 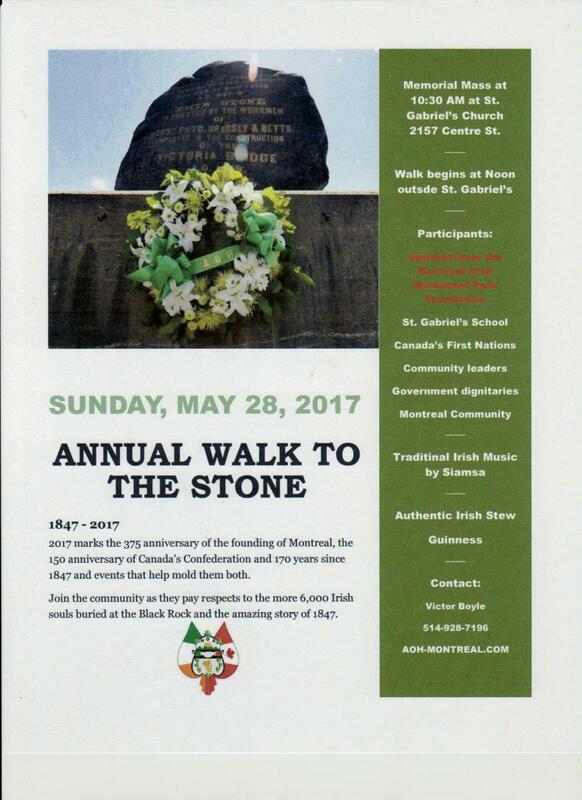 For 150 years or so, the Ancient Order of Hibernians (AOH) have led a walk to the site of the Black Rock (just on the Montreal side of the Victoria Bridge) - in memory of the 6000+ Irish immigrants that died and were buried in the area in 1847-8. The March begins from St. Gabriel’s Church on Centre St. in Point St. Charles and starts after a Mass that normally takes place at 10:30 or 11pm (we will confirm the time of the Mass in the next days). 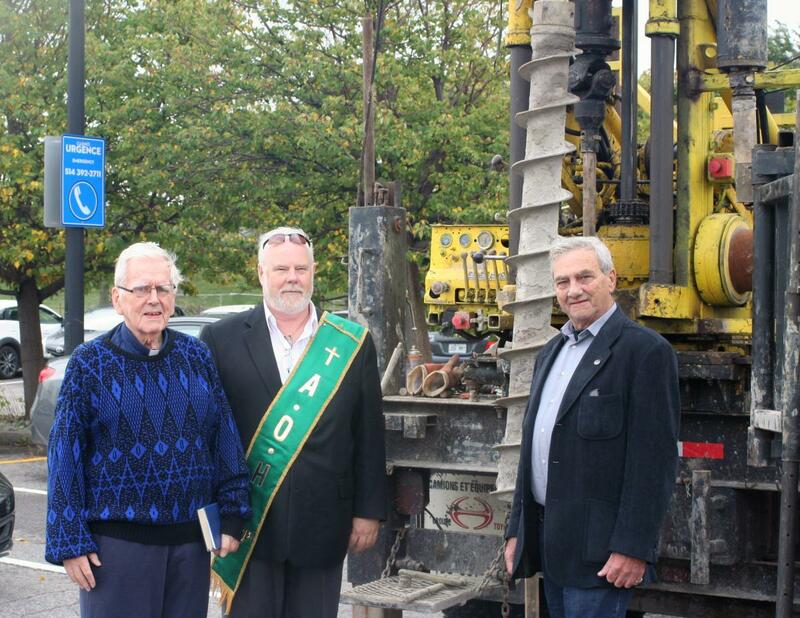 Once again the AOH has invited our group – The Montreal Irish Monument Foundation to join them in the March and remind everyone of our objective to build a beautiful green space in the area of the Black Rock. Hope all of you will be able to attend this event and as mentioned we will provide any updated information in the next weeks. Our Grey Nuns Exhibition opened at the Centaur Theatre on Monday, April 11 2016, with great success. And we did receive some great Media coverage. Here are a few of the links to the interviews etc. Victor Boyle, and Fergus Keyes, in an interview on Global TV. As mentioned some time ago, Quinnipiac University in Connecticut opened their Grey Nun’s Exhibition on March 17th 2015, closing it a year later on St. Patrick’s Day, 2016. This exhibition highlights the efforts of the Grey Nuns to provide help and comfort to the poor Irish Immigrants at Montreal in 1847. The curators were Professor Christine Kinealy, (Ireland’s Great Hunger Institute) and Dr. Jason King, (National University of Ireland, Galway). We are now pleased to announce that Quinnipiac University have transferred various items in this exhibition to The Montreal Irish Monument Park Foundation. Our hope is to display this exhibition, over the next year, at various locations in Montreal, and perhaps other parts of Quebec. We plan to open it first, for only a few weeks, at The Centaur Theatre from Tuesday, April 5th until Sunday, April 17th 2016. Unfortunately due to space, and time constraints, we will only be showing a portion of the overall exhibit at The Centaur. Once we close at the Centaur, we are looking for other public spaces where we can show more of the exhibition, and certainly would be pleased to accept your suggestions. However, the portion at the Centaur will still provide a good overall view of the event, and thanks to both The Centaur, and our sponsor, The Irish Embassy Pub, (1234 Bishop Street), you will be able to view this portion of the Exhibit for free at the Centaur. So on any day between April 5th and April 17th (with the exception of Monday April 11th when the exhibit will be closed), you are invited to visit the Centaur between 11am and 8pm and take a look. However, as mentioned in the past, and now confirmed, all of the property needed for this beautiful green space is currently owned by the Federal agency called “Old Port Montreal”. This organization is currently asking for comments on planning for the area. We think that it is very, very important that everyone on this site take a moment to register; and then submit a comment for this consultation highlighting the need to preserve this area for a Memorial Space. So please do take a moment over this long weekend to forward your comments to this consultative process and share this post. As we start 2016, members of our group continue to speak with all levels of Government – Municipal (City of Montreal), Provincial (Quebec), and Federal (Canada) in an effort to build a beautiful Cultural Green Space on the site of Montreal's Famine Cemetery. Designed as a permanent installation, the memorial park will be dedicated to the memory of the 6000+ men, women and children buried in the area, as well as some Montrealers who tried to provide care and comfort, caught Typhus, and died themselves. We hope that we will soon have some level of commitment to create this space. Are you willing and able to make a donation to the effort to promote this project? Also, If you purchase products via Amazon.ca, please see the note below. Reach Amazon via the link noted and the Foundation receives a small rebate…. Let the Mayor of Montreal know that you support the project. Join our Newsletter list and stay up to date on the project. In the hot Calcutta like summer of 1847, a number of Irish immigrants arrived in the city. 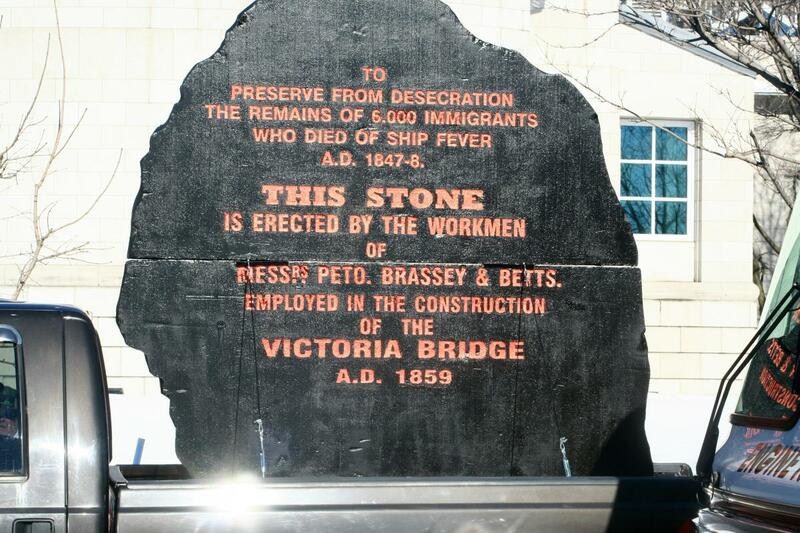 Many had ship’s fever (typhus) and as result approximately 6,000 men, women and children died and were buried in the area of the Montreal side of the Victoria Bridge. In effect, everyone using the Victoria Bridge is driving over a cemetery. Currently the only monument to this tragic event is “The Black Rock” that sits by itself while cars zoom by on both sides. 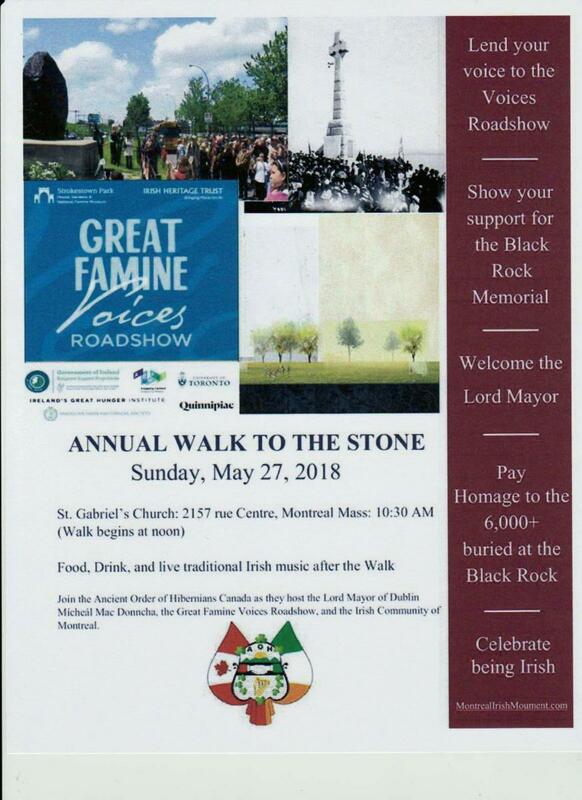 During the annual “Walk to the Rock” this year (2014), an announcement was made that a new group called the Montreal Irish Memorial Park Foundation had been formed with the objective of having all levels of Government support the building of a large Cultural Green Space in the immediate area. At the moment the area is rather desolate and most of the property appears to be owned by the City of Montreal and/or the Federal Government. The concept of this effort would be to honour these 6,000 Irish immigrants that died on the spot; to also honour the many French speaking Quebec families who adopted, and gave homes, to the almost 1,000 children who were orphaned by this tragedy; and to honour the many Montrealers who went to aid these poor immigrants and caught the fever and died, including John Mills, who was Mayor of Montreal at the time. This general area also appears to have been an important meeting place for Aboriginal groups prior to the arrival of Europeans. On a practical level a properly designed cultural park, with sports facilities, would provide green space in the rapidly developing Griffintown area; make a much nicer entry to the City of Montreal; could perhaps be a tourist attraction for the millions of Irish in North America whose ancestors arrived and survived that 1847 Montreal summer. It would seem that the City and Federal Governments would like to designate this whole area for light industry and/or housing. Since the area is currently wide open with a great deal of space taken up by a seldom used City parking lot left over from the time when in the 1960’s when the City of Montreal destroyed the entire residential section known generally as “Goose Village”, to design and build this large cultural green space would not seem to be a difficult or even an expensive project. It would not require any demolition; the City of Montreal seems to have some surplus funds available for green space development; and apparently a part of the condition of building permits for the Griffintown developers was that they set aside some funding for green space in the district. Some individuals; Irish groups; and others have already indicated that they would be willing to donate some funds to the building of this community imitative. This could certainly be a big; beautiful and positive project for Montreal. And, if planning for this cultural green space/park were to start soon, at least the basic green space could likely be ready for 2017 – the 375th anniversary of Montreal; and 150th anniversary of Canada.